Q: How can I insulate the walls of my double-brick house? The place was built in 1950. One contractor says he can drill holes in the plaster and blow insulation into the space between the bricks, but another says this won’t work. A: Even though it’s summer, boosting home heating efficiency is still worth planning for. And though it’s certainly possible to drill holes and try to blow insulation into your walls, chances are the space is choked with hardened bits of mortar that fell into the space as the bricks went up. This would prevent loose insulation from getting into every nook and cranny, and even if it did, moisture would probably be a problem. Bricks aren’t good at keeping rainwater out, especially old bricks. That said, injecting slow-rise foam into the wall cavity holds a lot more promise. You can do this work yourself using a spray foam kit, and slow-rise formulations are made especially so the foam expands and creeps slowly into wall cavities. It works especially well in hollow wood frame walls, but works for brick if you take special measures to “see” where the foam goes, drilling and spraying accordingly. 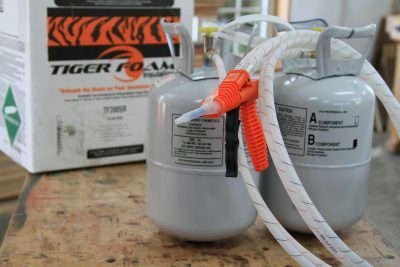 Tiger Foam (www.tigerfoam.ca; 888.844.3736) is the only source of slow-rise spray foam kits that I know of in Canada. This material gives off heat as it cures, allowing you to use an infrared camera to see where the foam has and has not crept in. Another approach involves applying two inches of extruded polystyrene foam to the inside or outside face of exterior walls. This is a big job involving tricky finishing work around windows and doors, but it does work. Trouble is, it only makes sense if you’re planning to install new siding on the outside or drywall on the inside. To see the the foam injection process used to warm a home with an uninsulated wooden wall frame, click below. How much can SIPS help with ongoing cooling and heating costs?